Earlier this week, we shared that several new experiences inspired by the film, Rogue One: A Star Wars Story, will soon make their way to Disney’s Hollywood Studios. 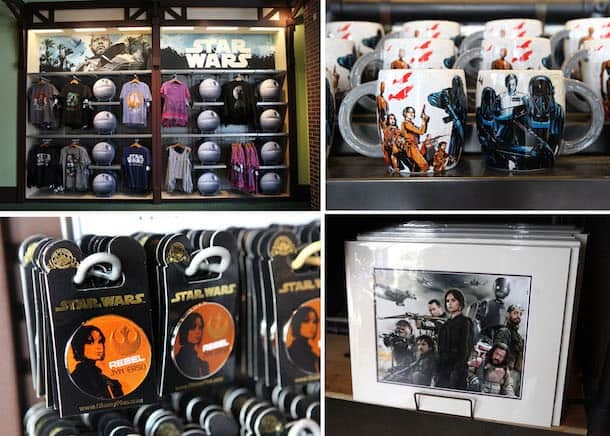 Now I’m happy to share a look at some of the latest Star Wars merchandise you’ll soon be able to find at Disney Parks starting this month. Rogue One: A Star Wars Story revolves around a rogue band of resistance fighters who unite for a daring mission to steal the Death Star plans and bring new hope to the galaxy. Being a long-time Star Wars fan, I’m counting down the hours until the film is released in theaters on December 16, 2016! Here is a look at several products guests will find this month at Disney Parks. 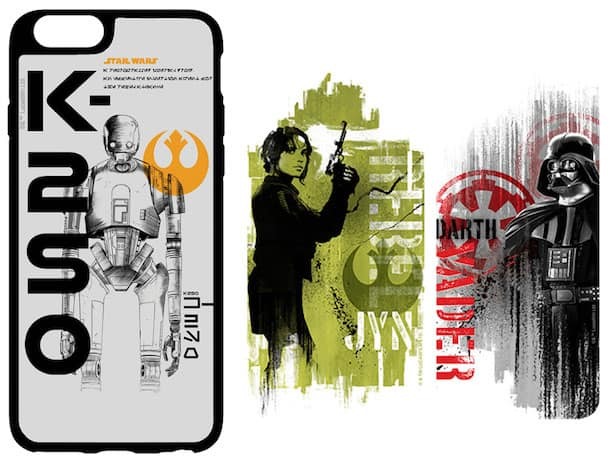 You may recall we released Rogue One merchandise at the end of September 2016. Many of these items, such as apparel, pins, toys, home décor and more, are available today in select merchandise locations at Disney Parks. In early December, we will release several new character designs to the D-Tech on Demand stations at Disney Parks. At these stations, guests can create and personalize phone cases for select mobile phone devices. On December 16, we will release several new products to celebrate the film’s opening day. Guests will find a limited release Vinylmation mystery set. There are 11 known characters in this series and one mystery chaser figure. You can either purchase individual mystery boxes containing one randomly selected figure each, or you can purchase an entire tray. A new limited edition retail MagicBand 2 inspired by Director Krennic will also be released on opening day. This retail MagicBand will have an edition size of 2,000 and will be packaged in a decorative box. Guests should also look for two jumbo-sized pins in select merchandise locations. The hinged Death Star pin (top image) will have an edition size of 3,000, while the Rogue One character pin (bottom image) will have an edition size of 1,000. 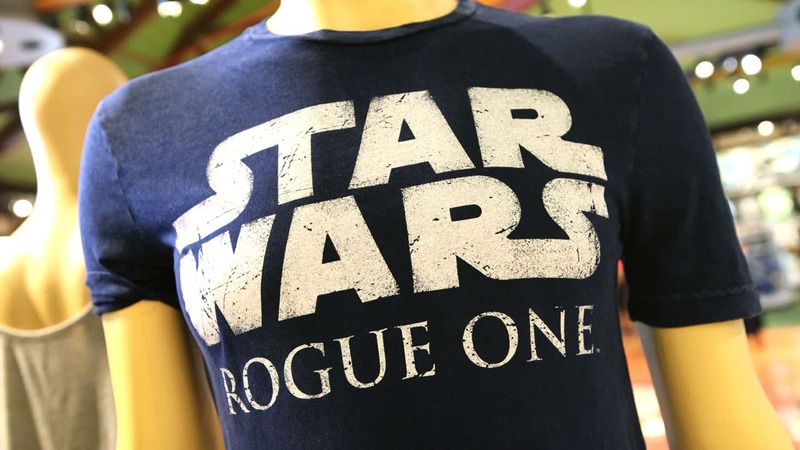 Finally, guests can personalize four new nametags by having their names written in Aurebesh, one of the alphabets used in the Star Wars universe, starting December 16. 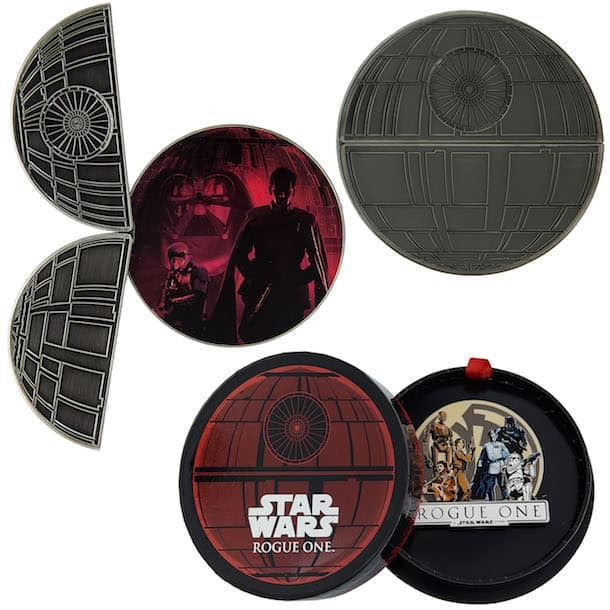 Two nametags – Darth Vader and Imperial logo – are limited release items created for Rogue One. We also made two nametags exclusive to Annual Passholders (a valid Disneyland Resort or Walt Disney World Resort Passholder ID or Premiere Pass and a photo ID is required to purchase). 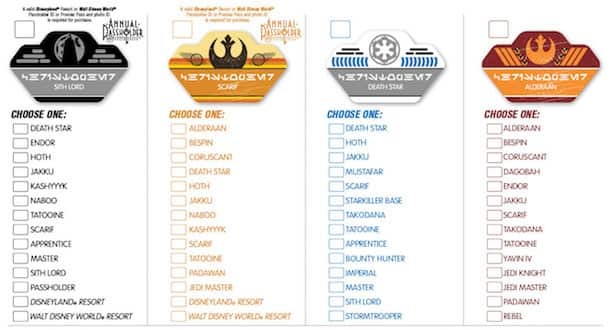 Look for these nametags at Tomorrowlanding in Disneyland park and Gone Hollywood in Disney California Adventure park in California, or at Star Wars Launch Bay in Disney’s Hollywood Studios and Merchant of Venus in Magic Kingdom Park in Florida. Select items (excluding nametags and limited edition pins) from Rogue One: A Star Wars Story are also available for purchase on the free Shop Disney Parks Mobile app. Hi, Where exactly can I find the LE Jumbo pins at Disney World? Thanks! @Dave – My apologies for the trouble. I’m confirming with the MagicBand team the locations that may carry it. I just checked Shop Disney Parks app and found the MagicBand 2 item available for order now. You could have it shipped directly to your home using the app which may save you time. As soon as I have additional details, I’ll follow up. How much are the 2 large, round Death Star pin pins? Was there an opening day release today? Thanks and Happy Holidays ! @Joseph – The pins are $84.99 each (please note all retails are subject to change without notice). The jumbo-sized pins are the only pins for “Rogue One: A Star Wars Story” being released at Disneyland and Walt Disney World Resorts. In addition, how much will the nametags cost. @Henry – Retail for the jumbo-sized pins are $84.99 each. Please note that all retails are subject to change without notice. 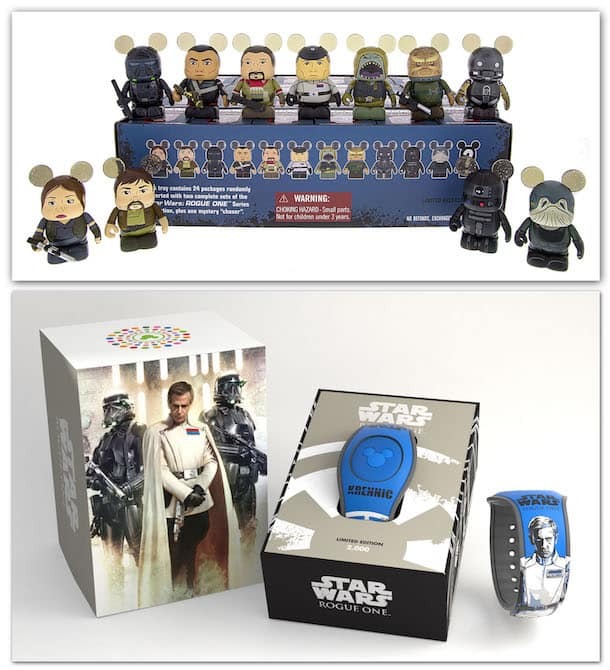 Will the Krennic magicband be $32.99? Or will they be a different price? Any word on when the mouse droid will be released? Please? @Shanna – I believe the Mouse Droid ran into several Wookies while on the way to Disney Parks, so it’s still on the way. I don’t have a confirmed release date at this time. Where can we pickup the new Magicband? 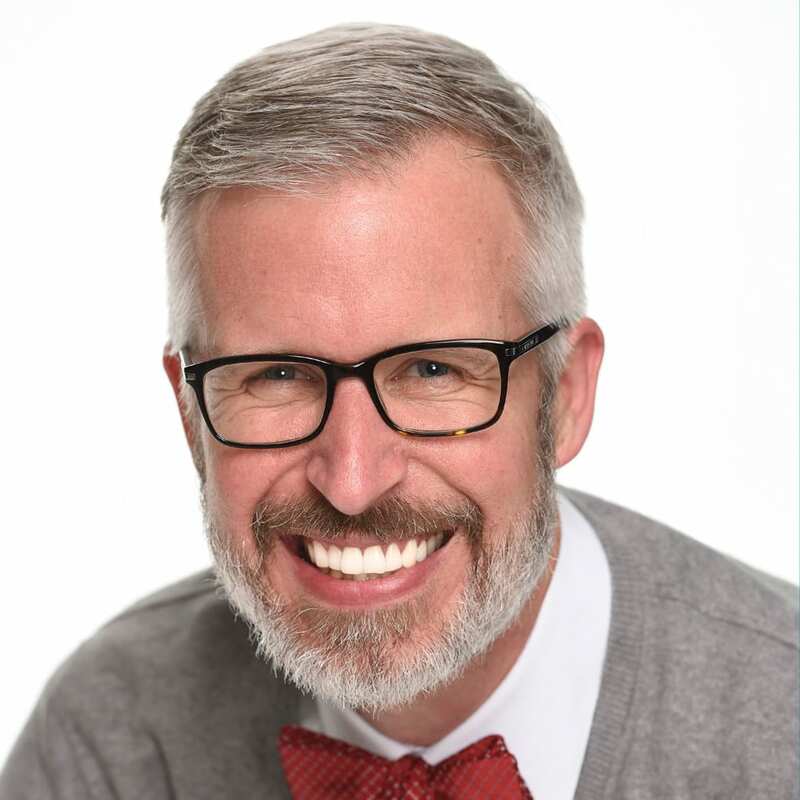 @Deric – From my understanding, it will be released in each of the four theme parks along with Disney Springs (try Star Wars Galactic Outpost in Disney Springs West Side for example). I would also look for it on Shop Disney Parks app. Does Director Krennic have the honor of appearing on the first publicly available MagicBand 2? 🙂 Or will there be any others sneaking out earlier by chance? I will be in the parks this weekend and was hoping to pick up one of the new style! @Julie – Keep watching DisneyParksBlog.com as I’ll provide any updates about future retail MagicBand 2 items. So you WERE demoing a new name tag last night! I thought it had looked new! Can’t wait to see them in stores! 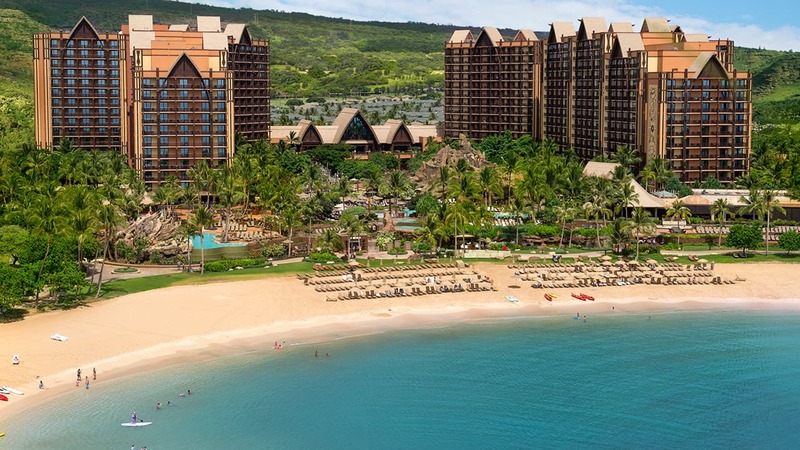 How much will be the new magicband? When will this become available? Any other designs coming?